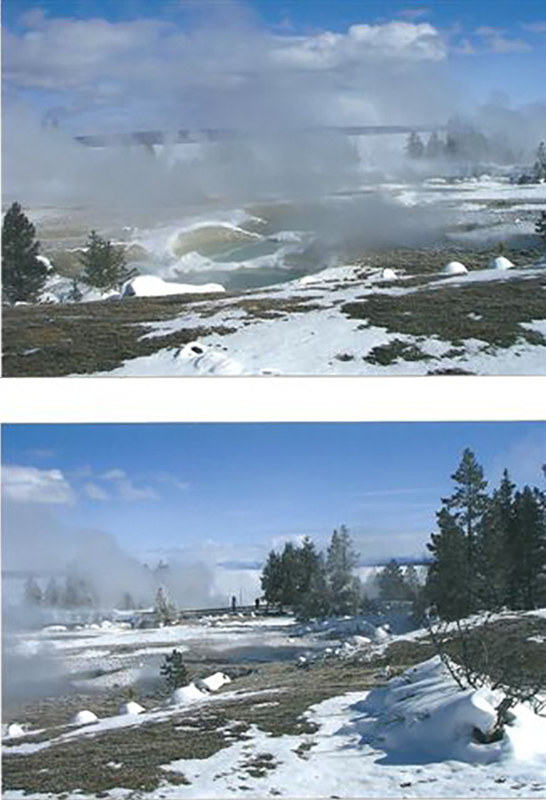 Steam rises from the pools of hot water at Colter’s Hell during a winter visit to Yellowstone Park a few years ago. As I snapped the pictures, two brave souls walked the catwalk above the bubbling hot water. Today, I’d like to welcome a guest blogger, Mary Lou Schulte, Editor of the Osage County Historical Society newsletter. She has graciously given me permission to print this article she had published some time back about John Colter. Here in Missouri, where the real west started, history is all around us, all we have to do is look for it. The saying goes that “truth is stranger than fiction.” Sometimes truth is much more incredible than fiction. The life of John Colter is a testament to that concept. His adventures were so unbelievably daring in scope, thrilling in discovery, and terrifying in life-threatening ordeals that we modern folk can hardly take them in. He deserves a place in history beside that of Daniel Boone, Davy Crockett Zebulon Pike, etc. Yet many do not know his name. In the fall of 1804, they arrived at the Mandan village, and here they built Fort Mandan, which was their winter home. In April, 1805, they again set forth–a total of 33 souls, including Toussaint Charbonneau, his wife Sacagawea (the young Shoshone woman who was to render inestimable service to the expedition), and their infant son, Jean Baptiste. After incredible toils and hardships, they reached the mouth of the Columbia in the first week of November. Near the Pacific Ocean they built a post named Fort Clatsop, where they spent the second winter. Colter had gone with a companion named Potts to the Jefferson River to look for beaver. Suddenly a war party of several hundred Blackfeet approached and ordered them to come ashore. 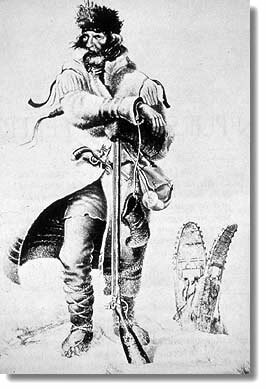 Colter obeyed, thinking he might escape with losing furs only, but Potts stayed in his canoe, seeing Colter stripped naked by the Indians. Potts foolishly shot one of the Indians, and was then shot, dragged to shore, and cut to pieces with hatchets and knives. Colter had no idea what horrible fate awaited him. After holding a council, the chief waved him away. As he walked toward freedom, he saw some of the braves throwing off all encumbrances, as if for a race. He realized he would have to run for his life. He ran like the wind toward the Madison branch, five miles away. His nose began to bleed profusely. Finally, in looking back, he saw that he had outstripped all his pursuers, save one. He turned, accosted his enemy, seized his spear, and stabbed him to the ground. He reached the stream ahead of his attackers, plunged in, and took refuge inside a pile of driftwood or beaver dam. He remained there until the next morning, when it was evident that the Blackfeet had gone. He headed for Manuel’s Fort, and after about a week, arrived there exhausted by hunger and fatigue. He was emaciated and his feet were swollen and pierced by many thorns, but he was alive. He not only recovered, but went back on his own voyage of discovery. One more time Colter ventured into the Three Forks area and was again attacked, but managed to escape. Finally, he made a vow to God that he would never repeat such a foolhardy venture. However, in late September, 1809, he met up with an expedition headed by Manuel Lisa and Pierre Chouteau. They asked him to be their guide, and forgetting his vow, he agreed. A fort was constructed near the Jefferson River, but only a few days later the Blackfeet attacked. Five members of the expedition were killed, and they lost most of their traps, horses and beaver pelts. This crushing blow caused the enterprise to be abandoned. Colter finally returned to St. Louis, where his stories of discovery and adventure were met with skepticism by some and with awe by others. His claims have been verified over the years, however, and a stone with the inscription “JOHN COLTER -1808” carved on it is now on display in Yellowstone National Park. John Colter took a tract of bounty land on the south bank of the Missouri River in Franklin County and turned to farming. He married Sarah “Sally” Loucy, and had at least two children: a son, Hiram and a daughter, Evalina, both of whom grew to adulthood. 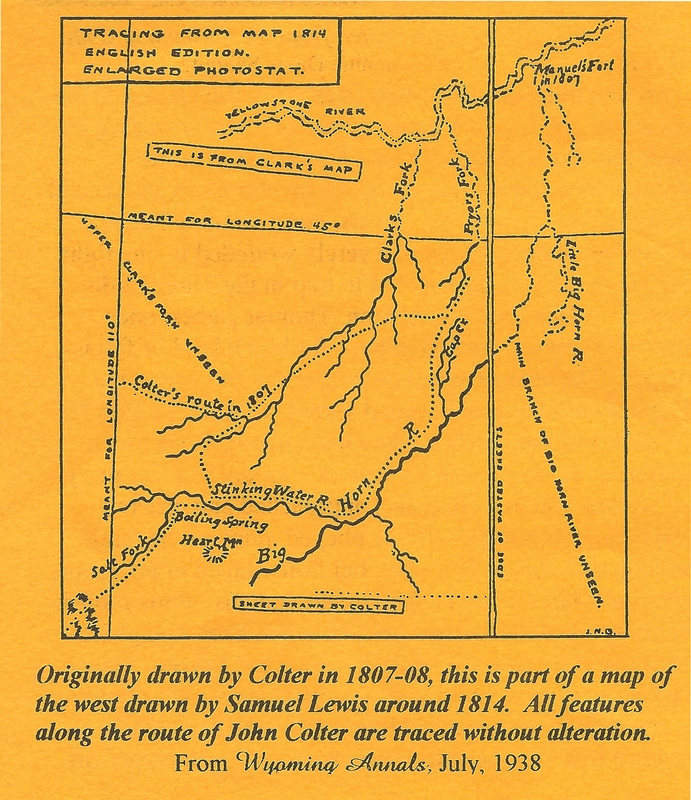 Ruth Colter-Frick, author of Courageous Colter and Companions, believed that John Colter was buried in Franklin County on a bluff overlooking the Missouri River near New Haven. This is the cemetery where his son, Hiram, is buried. An old headstone with the initials “J.C.” carved into it was uncovered close to Hiram’s grave. Other writers have speculated that he was originally laid to rest on Tunnel Hill, a bluff overlooking the Missouri near Dundee, where he lived. When the Missouri Pacific Railroad tunneled through that area in the 1850’s, a number of bones were found, indicating a burial ground. But where he is buried is not as important as the legacy he left. His name will forever be synonymous with adventure, discovery, devotion to duty, and bravery in the face of death.